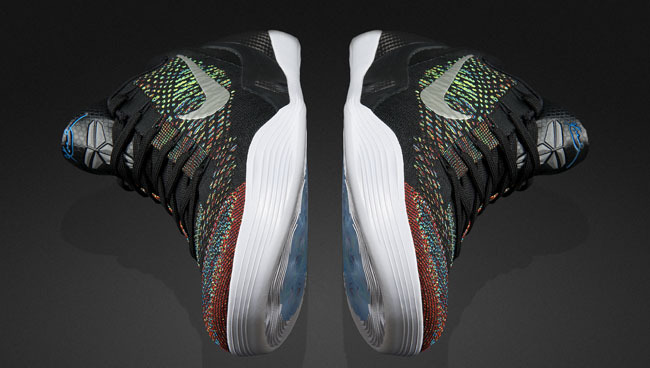 The HTM edition of the Kobe 9 Elite Low features all of Nike's latest innovations, but will anyone that wants to play in them be able to get a pair? This morning we saw the introduction of the HTM edition of the Kobe 9 Elite Low. While the standard editions of the 9 Low have utilized engineered mesh, these editions go back to the Flyknit found on the high-top version. It also replaces the Low’s plastic midsole shanks with carbon fiber. These changes make for a true low-top edition of the original model, with no compromises to the high-end performance elements. For those of you who have come to favor low-tops to hoop in, this may be the exact model you’ve been hoping for. But there’s a problem. In the same press release that touted it for showcasing “pinnacle basketball innovation,” it also called this HTM edition a “lifestyle celebration,” which will only be available at Nike Stadium Milano and Excelsior in Milan. In typical HTM fashion, the designs are clean and understated. The shoes feature neutral color palettes, ranging from heathered white and gum to black and marble. The aesthetic very much keeps with the spirit of Milan design week, which they were unveiled to coincide with. But, just to clarify – this is a lifestyle edition, of a performance shoe. This isn’t the first time Milan has served as a launching point for HTM editions of Nike performance product. A year ago we saw limited edition Flyknit Racers and Trainers launch around design week as well. The HTM concept has come to generate instant energy around a product, and has a history of being highly collectable. But while it may make sense from a design and energy standpoint, creating an inaccessible performance shoe doesn’t seem to coincide with Phil Knight’s motto of “Never forget to hear the voice of the athlete.” If basketball players did care about a design-forward edition of this shoe, they wouldn’t be able to get their hands on it anyway. I’ve been highly disappointed with the performance of Nike Basketball’s line this season. While the shoes may have looked great, and released in more colorways than I could ever keep track of, they fell far behind in terms of playability. In the past, they’ve always had Zoom Air to fall back on, but since Jordan Brand’s introduction of Flight Plate, Nike hoops no longer even owns the best cushioning platform. Sure, the shoes are selling as well as ever, but they’ve been limited in terms of performance. And that makes it frustrating to see a release like this – which is supposed to feature the best of the brand’s current innovations – geared to consumers that will privilege off-court wear. The Kobe 9 was a shoe launched at an art museum, but at the end of the day, it's still a basketball sneaker. We were told the shoe would redefine basketball footwear with its Flyknit construction, yet rather than actually make it to the court, it’s releasing in high-concept, limited editions. I can appreciate a Masterpiece, but I can’t appreciate its performance to play in if finding a pair becomes a challenge.